Insurance: What are the Activities of Daily Living? As you age, you may find yourself in a situation where you have trouble doing basic household activities. 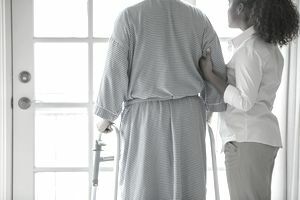 Insurance companies that provide long-term care insurance have defined these items as "activities of daily living" and use these definitions to determine if you qualify for benefits under the terms of the insurance policy. Most long-term care insurance policy benefits start when you need help with at least two of the six activities of daily living. Each long-term care insurance company may have their specific definition of the activities of daily living, so you will want to refer to your policy for their version, and for details on what is required for you to be eligible for benefits. Example: Joy needed help getting dressed and preparing meals. These two things are two of the six activities of daily living. Since Joy needed help with her activities of daily living, she called her long-term care insurance company so she could find out if she could use her insurance to pay for someone to come to her home and help her with these tasks. The evaluation helps determine what activities of daily living you need assistance with and coordinates your needs with the benefits provided by your long-term care insurance. Some insurance policies offer a monthly reimbursement structure and cover in-home care. Such policies can be quite useful for someone later in life. Other policies provide a daily limit, such as $200 a day of care. Let's look at the difference. Example: Suppose Carl needs help bathing and dressing every day. Let’s assume the cost is $40 per hour. On Mondays in addition, to help bathing and dressing, he also likes to have all his meals prepared for the week and the laundry and cleaning done. The cost of services performed on Monday might be $300. With a daily reimbursement of $200 that would exceed the policy limits on Monday and he have to pay out of pocket, but his costs would be under their limits on other days. With a monthly reimbursement policy, this would not be an issue. The insurance company would pay up to the monthly maximum of $6,000 per month ($200 x 30 days) which would cover the higher cost on Mondays and enable Carl to have greater flexibility in how services are scheduled. If you or a loved one are struggling with basic household activities first check your insurance to see if you qualify for financial assistance. If insurance won't cover the items needed you can always pay for in-home care out of pocket, just as you would pay for any other service. If you don't have insurance and don't have the financial resources to pay as you go, look for other ways to pay for assisted living costs - often there are community resources and non-profit organizations that can help.